LA CANADA FLINTRIDGE >> In time, St. Francis vs. La Salle may become one of the top high school football rivalries in the West Valley. But Friday night the schools’ first meeting was instead a coronation for host St. Francis. Jeremiah Martin accounted for 250 yards and six touchdowns and the Golden Knights clinched A a share of their first league title since 1997 with a 60-0 victory over the Lancers in an Angelus League game at Friedman Field. Jasher Foster had four receptions for 125 yards receiving and two scores and Dylan Crawford had two for 41 yards and two touchdowns for St. Francis, which improved to 9-0 overall and 4-0 in league play. St. Francis, by virtue of Harvard-Westlake’s 28-14 win over Salesian, clinched the league’s No. 1 playoff spot. La Salle slipped to 3-5 and 0-4. MONROVIA — Monrovia wrapped up the Rio Hondo league title Friday, beating La Canada 24-7. Octavius Spencer had two punt returns for touchdowns yards in the first half to lead the way on his senior night. The combination of off-and-on rain and the majority of the student body deciding to skip the game made for a strange Halloween night. Monrovia came into the game winning its last two by a combined score of 88-12. The Wildcats (8-1, 4-0) couldn’t make plays early on to take control. When they did manage to move the ball, they had problems taking care of it with two early turnovers. Rosemead High School clinched at least a share of its first Mission Valley League championship in six years with a 51-14 victory over South El Monte on Friday night. 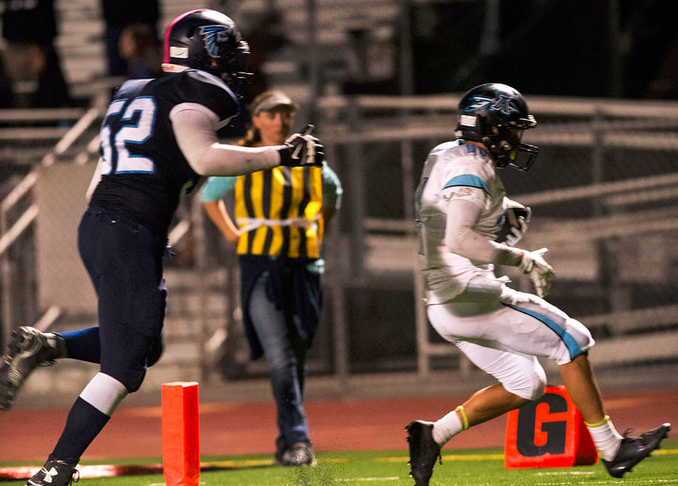 The Panthers (5-4, 5-0) can take the title outright if they defeat Mountain View next week. The Eagles (3-6, 3-2) did not make it easy early on. DUARTE — With just three rushes this season entering Thursday night’s game, junior Dominic Ramirez totaled only 30 yards. With his first three touches of the ball Thursday, the 5-foot-8 Azusa High School running back totaled three touchdowns on runs of 69, 46 and 4 yards. And he wasn’t through as he ran for another two scores and finished with 179 yards on 11 carries as the Aztecs defeated host Duarte, 49-30, in a Montview League game. “I just told the coach to put the ball in my hands and I’ll make something happen,” Ramirez said. PASADENA — There was no chocolate, strawberry or even pistachio in Muir High School’s 40-0 Pacific League game against Hoover on Thursday night. The Mustangs ran right at the Tornadoes, scoring on their first five drives. Muir (5-4, 5-1) had a 27-0 lead and a running clock at the end of the first quarter. San Marino’s Devon Jack and La Canada’s Ally and Cassie McKenzie won Rio Hondo League individual tennis championships at Live Oak Park in Temple City. Jack scored a 6-0, 6-0 win over Molly Round of South Pasadena in the finals. Emily Hsaio of San Marino beat Sawa Keymeulen of South Pasadena for third place. The McKenzie sisters defeated San Marino’s Madeleine Gandawidjaja and Sophia Lee 6-2, 6-0 in the final. Serena Lin and Katherine Wu of Temple City defeated Sabrina Lieu and Maddi Schmidt of San Marino 4-6, 6-4, 21-19 for third place. San Marino has won eight consecutive league team titles. LA CANADA >> League champions find a way to dig deep and pull out victories. Somehow, that is what South Pasadena High School did in its Rio Hondo League volleyball showdown against La Canada on Tuesday afternoon. The senior-laden Spartans, playing their final regular-season home game, certainly found a way that made the league-champion Tigers figure that out in the fifth game. La Canada rallied from a 20-9 deficit in the fourth game to force a final fifth game.